I feel like I am finally coming down from a massive Allergy Show high, so it’s time to collect my thoughts and share my top twenty . It was going to be a top ten but I had too many. It might end up being a top twenty because this year, the show rocked. It was huge, It was busier than ever but the wider aisles made it never seem like the crush of previous years. Speaking about Living with Multiple Allergies – The picture above is of my lovely audience waving to me at the end and WOW what an experience. I was so nervous, but once I stood up and started to talk and managed to get a few laughs and engage with the audience it was fun. I lost my place a few times but it went by so fast, I ran over a bit into question time and even read a few of my poems at the end. I had such an amazing response from everyone, lots of questions, some very hard to answer and some easy to answer. A group of us chatted for ages afterwards and it was great talking to one eleven year old who was wondering what a life with allergies held in store for him. Thanks everyone, especially Pure Potions for coming over with a free pot of Skin Salvation. I’m enjoying that on my eczema. What a treat! The FreeFrom SkinCare Awards 2014 winners were announced on the first day of the show. As a judge this was a must attend event and it was great to see so many small independent companies do well this year. 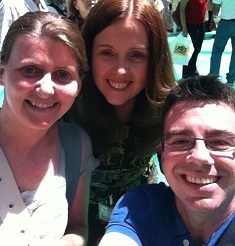 Meeting friends, bloggers, twitter contacts – I remember the first Allergy Show I went to some five years ago. This year was a far cry from that, wandering around not knowing anyone and not really learning much either, maybe finding a few companies to look out for. Now the show is huge, there is so much to learn and so many new companies entering the freefrom arena. The best thing is that I actually know people now and not just the stall holders. I know friends from Twitter, from the Support Groups I organise, from other shows, networking event, speaking at the Houses of Parliament. It’s a real social occasion and I even made it for the end of a Tweet Meetup with the coaliacs. 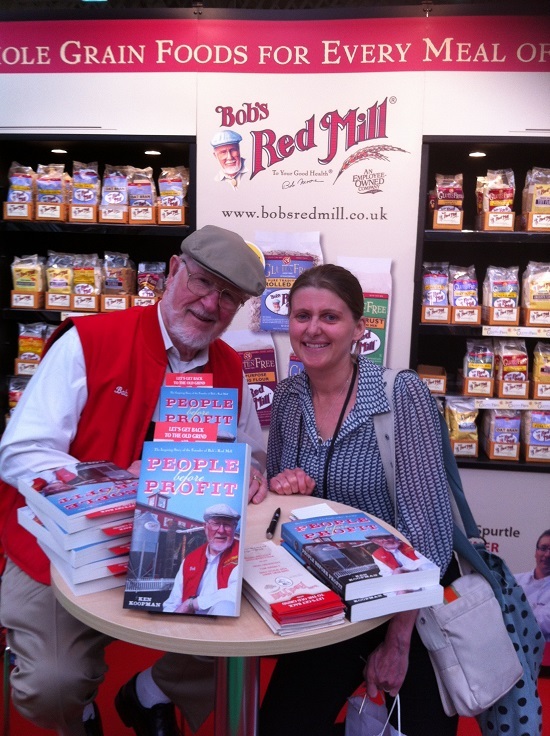 Meeting THE Bob of Bob’s Redmill – I bought a chocolate brownie cake mix because I got one last year and managed to produce some pretty amazing brownies. I also got a free book about the history of Bob’s Redmill signed by Bob. There really is a Bob. I think he might actually be Father Christmas, so this what he does during his summer vacation. 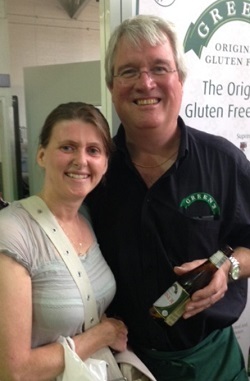 He was very friendly and proud of his company and how well they’d grown over the years from humble beginnings making wholegrain bread and cakes until the branched out into freefrom after customers asked them to provide gluten and dairy free. Mozza Rizella – OMG! this cheese is just amazing… and created by an Italian and what self respecting Italian doesn’t know his cheese? This stuff though, it’s so good. I have never tasted a dairy free cheese that took me back to my cheese eating days in quite the same way. The plain cheese and the smokey flavour were just delicious. My only show disaster was forgetting to go back to the stall and buy some. Dammit. I have struggled to find this in the shops but I’m getting myself some now no matter what it takes. The ingredients are very clean and simple too, nothing nasty in it and it’s wheat, gluten, dairy, soya and nut free. Awesome! Everything for Eczema – Now this might be possibly my favourite find from the show. I know I’m a big kid at heart so finding these Bamboo pyjamas from Soothe, which were like the ones you can get for babies and kids, but made in adult sizes had me beaming from ear to ear. They are so soft and made from bamboo so they don’t itch the skin and are breathable and warm. The feet at integral so you can’t scratch your legs and feet in the night and you can also flip over little mittens to cover your hands. Apologies for the photo here, it’s not great quality, but here I am modelling the pjs the morning after I wore them for the first time. They were so comfy and warm. Since the first wear it’s been a little too hot and muggy to wear them but I cannot wait for winter and some colder weather to give these a proper testing. I’ve worn them twice so far and the second night they did stop me having a good old scratch so they did their job. Plamil rum and raisin chocolate – let’s just say I bought rather a lot of my favourite flavour for a bargain show price. I’m not saying how much of it I’ve eaten already… too much! This is my all time favourite dairy, nut and soya free chocolate. Pure Potions skin salvation – thank you, thank you, thank you. I bought some scalp oil for my poor itchy head and also managed to purloin a free pot of the skin salvation, my favourite ointment for eczema skin, as a gift for being such an amazing speaker at the sho! Why thank you. Of course I’m brilliant at public speaking. Ilumi Z’atar chicken – I love the ilumi products and can eat the a few of their pouch meals including the Thai chicken, Cardamom chicken, pea and pancetta soup, chicken gravy and the a pork one. So at the show it was just brilliant to discover yet another flavour which is freefrom wheat, gluten, dairy, soya, celery AND tomato! Thank you ilumi. Z’atar chicken is possibly taking over from Cardamom chicken as my favourite but I’m not sure which I prefer. They’re both so good. Had it for my tea tonight. Pudology strawberry dessert – wheat, soya and dairy free delight. I have @chubbania who was helping on the Allergy Adventures stand to thank for this find. And I know how hard it is to share your freefrom stash, and she GAVE me one she had got from the stand because I was about to pass out from lack of sustenance. There wasn’t much in the way of ‘lunch’ food for someone with multiple allergies at the show. So thank you Nia. I loved it. It might have tasted like heaven in a plastic pot due to my state of stomach growliness but I need to get some of these for me. Oh! Gluten Free beer? Yes please! The gluten free beer – How could I forget the joys of drinking #GF beer at 10.30am in the morning… which did seem just plain wrong. I absolutely love our gluten free beer producers and I think they did realise that I was slinking past for more than just one sample. Thank you Greens, Celia and Daura Damm – we salute you! The husband actually preferred the Award Winning Greens ale to his own when I let him try it. He was only allowed one sip, just so he knew what he was missing. We need supermarkets to stock this beer. Come on Sainsbury’s, Aldi, Lidl, Coop, Budgens, Tesco, Waitrose, Morrisons, Asda, all of you. Stock a range so we have a choice and it might help them bring their prices down so you’ll sell more! KoKo Dairy free strawberry milk was a new one for me and delicious. I bought a bargain pack to bring home. Bfree, thank you, to all the staff for offering to make me a very late lunch on Sunday, the last day of the show, after I had finished my talk and finally found myself alone and starving hungry. 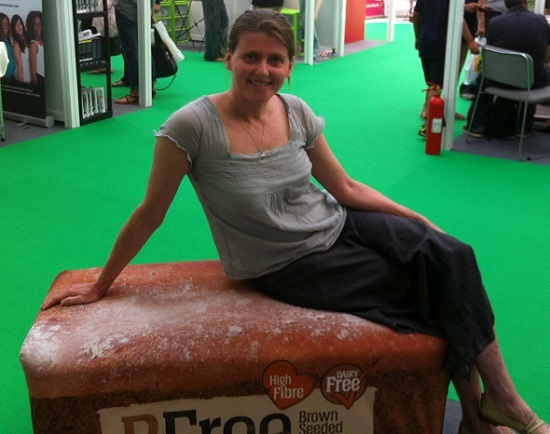 They made me a seeded bagel with guacamole which I wolfed down in about 2 minutes so no photographic evidence remains but here I am loafing around on the BFree loaf earlier in the show. More of these comfy loaves would be nice at future shows! Frank Bars – these are one of my favourite freefrom companies too. They make oaty snack bars in so many different and delicious flavours, most with coconut chocolate on top. Very tasty and a few bars did make their way into my bag. I couldn’t carry much more at this point. Next year I need to hire someone to carry my bags. Venice Bakery – one of my favourite freefrom brands were sharing their stand with MozzaRizella cheese – a great combination. I had a few slices of plain the pizza base just because I know I love it. I already had a freezer shelf full of this due to stocking up before the show. It freezes really well and cooks from frozen. Just remember that once you’re unwrapped the pizza, cook it quick and put a little oil on to stop the bases curling up. Vouchers – When I got home I discovered I have managed to collect almost a year’s worth of £1 and 50p off product discount vouchers – another great thing about the show. Look out for them on stands and grab them when you can. Just to see who reads my blog, I will send you, free of charge, a set of vouchers for products like ilumi, BFree, KoKo Dairy free, Udi’s etc. if you comment on my blog. Just leave a nice comment and I’ll be in touch for your details. First one gets the vouchers! FeelFree who have a whole range of gluten free products out gave me a sample of the alphabet shapes pasta which I will be cooking with my nieces when they come to stay in the summer. The ultimate test as these girls have very exacting tastes. If they don’t like it they won’t eat it! FeelFree pasta is made just from corn and water. Can’t get much simpler than that. Perkier Foods – I’ve never tried this brand before they had one range of guaranteed nut, gluten and dairy free cereal so I have bought a box to try. I keep hearing food things about Perkier so watch this space. Not tried it yet but it comes very highly recommended from David (in the selfie above). 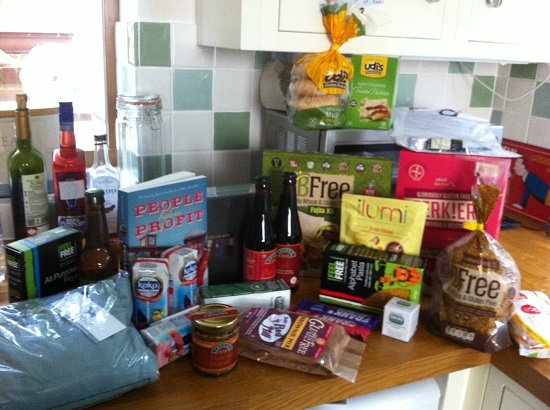 Udi’s Gluten Free– the show sponsers, had a huge range of products to try at the show. I tried the bagels and compared them with BFree’s seeded bagel. They both toasted well, both cut easily with no crumbling. It was a pretty fun bagel tasting and I could hardly pick between them. They are both wheat, gluten and dairy free so if you’re craving bagels these are great. 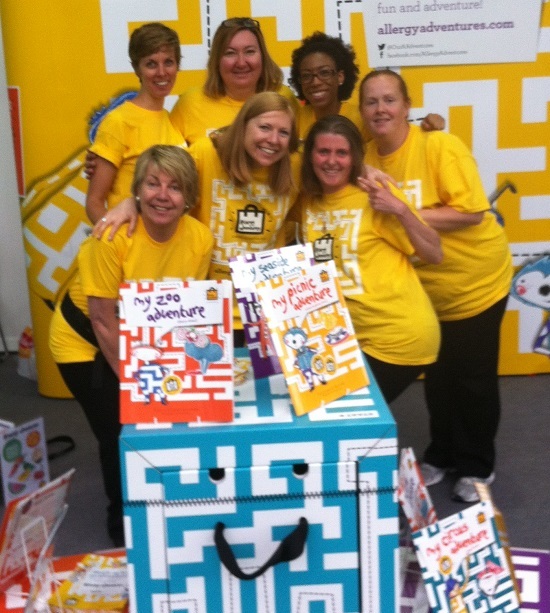 So I think we can safely say that this year, The Allergy Show Rocks – I loved this show. Wider aisles. Amazing new location with high ceilings, flooded with light and beautiful wrought iron and glass construction. Straight off the train and you’re there. There were more places for sitting down, more coffee stops and plenty of space. 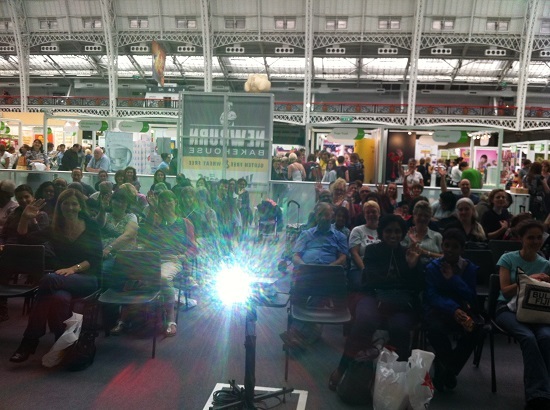 The show didn’t seem quite as rammed as it did last year. Next year I’d like to see some big A1 maps around the place to help us find our way. I got lost – a lot, and couldn’t find some companies at all, but then I can loose my car at the supermarket. I’d like to see a bit more effort to provide freefrom lunch that isn’t just a gluten free cake, roll or sandwich. I know I have multiple allergies and always bring a packed lunch but on day 3 my brother had eaten my humous during the night so I had no lunch! Dave I know it was you, I could hear you eating something through my door! And how about having similar companies near each other, like skincare together, eczema stuff together, freefrom all major allergens together! Can’t fault much though. Keep up the good work and put me down for 2015. James came back with quite a haul too! Beer, Vivani and Pana chocolate, Nature’s Store cheese crackers and Angelic biscuits. Finally some 9 breakfast bars and Natracare products. He said he enjoyed the fact he wasn’t exhibiting this year so could just wander around and he also enjoyed the freefrom skincare awards. Oh yes I briefly spoke to him I think, was he wearing the exact same shirt he wore the awards last year? He only realised when he saw the presentation slides with picture of the previous winner! It was fab show and I can imagine how nice it must be not having to do the whole smile all day long and try to sell your products thing.